This Bed and Breakfast is set on a houseboat, offering views of the Zeeburgerdijk canal. It offers spacious, modern accommodation with free Wi-Fi, a kitchenette and bikes available for rent. The room has a large seating corner set up around the TV. The kitchenette comes with microwave, refrigerator and a tea/coffee maker. Other amenities include king-size bedding and a rain shower. Guests enjoy a breakfast with fresh breads and juices every morning in the privacy of their room. 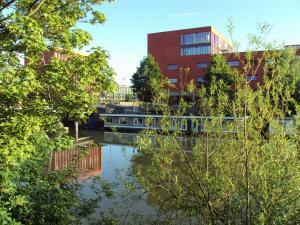 The surrounding Indische Buurt area offers a wide range of restaurant within walking distance. The Zeeburgerdijk tram stop is 50 metres away, offering easy access to sites such as Dam Square and the Museum Quarter. Amsterdam Central Station is 2.5 km away.